You are here > Health & Wellbeing > Baby Care > Barbie Fairy Room | Baby/Kid's Learning Activity Playset | Realistic | Giftware | +3Yrs. 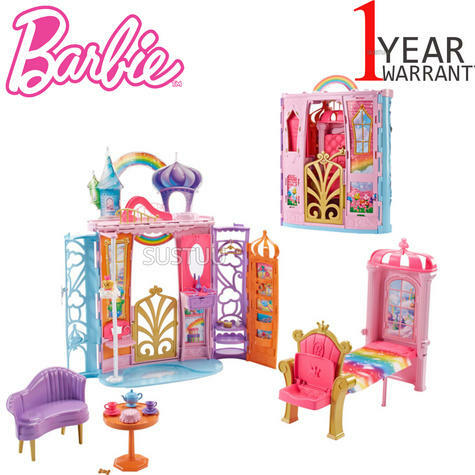 Barbie Fairy Room | Baby/Kid's Learning Activity Playset | Realistic | Giftware | +3Yrs. 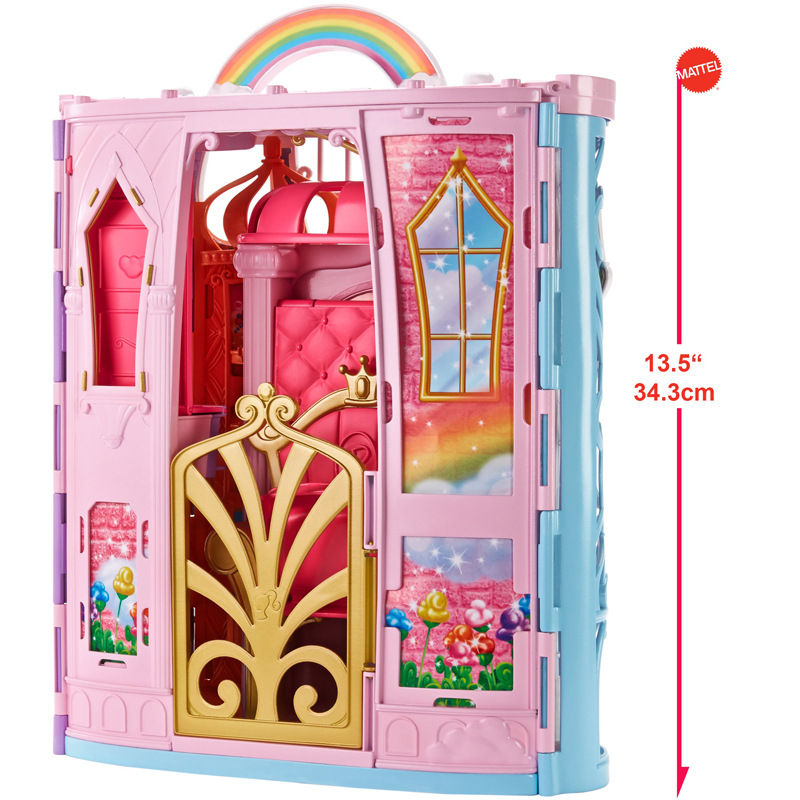 Enter a world of dreams when imaginations step through the golden door of the Barbie Dreamtopia Castle! 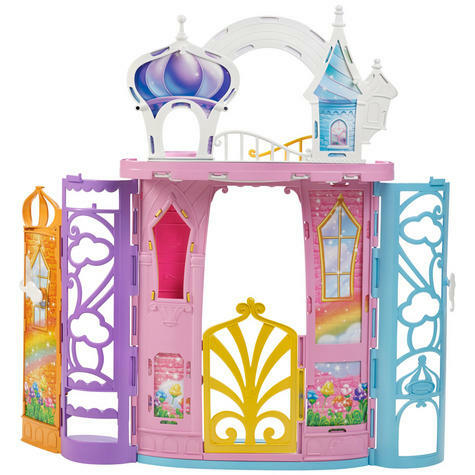 Inspired by the colourful land of Rainbow Cove, this castle playset sparks all kinds of storytelling - four magical play spaces transform rooms to expand play opportunity, and 15 pieces, that include a puppy, help design the fairy-tale home and spark fantastical stories. Open the Dreamtopia dollhouse to reveal the magic inside: the chest of drawers becomes a vanity, a pet seat flips down off the wall with a mirror for Honey puppy, a princess throne transforms into a bed (with soft rainbow-print blanket) for Barbie doll and her pet (doll sold separately) and an elevator can lift the puppy up to the rooftop on a cloud-shaped platform with child activation. On the roof, a puppy playground with slide for Honey figure lets animal lovers dive into pet play. In the house, kids can explore style and storytelling with a purple chaise, orange table and so many royally cool pieces. Serve up fun at teatime in the kitchen with a teapot, teacups and cake. 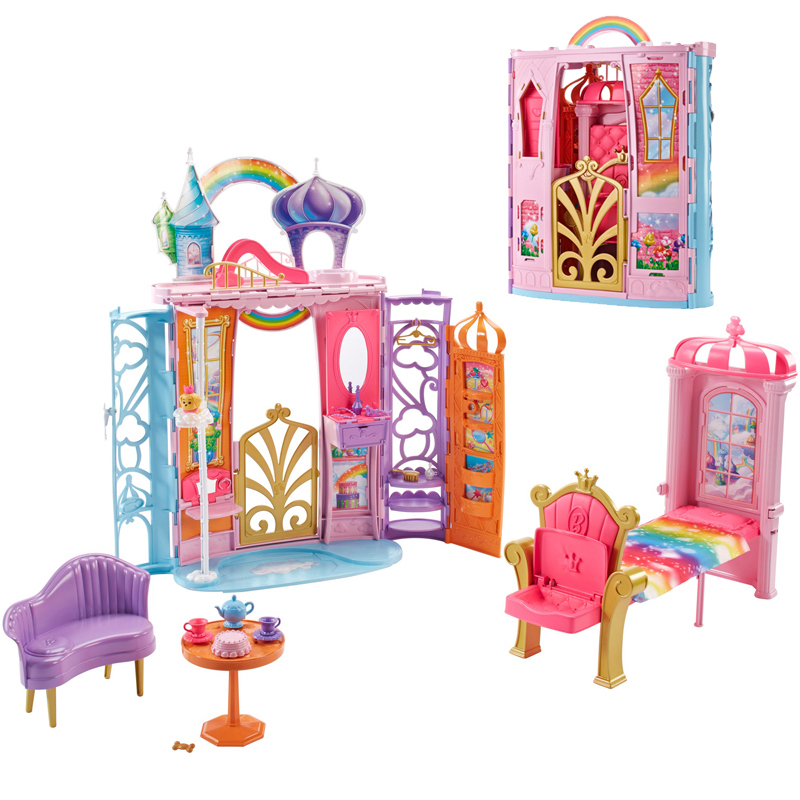 Style a princess outfit in the bedroom with a tiara, necklace, hanger and perfume bottles. Play out pet bonding with a bone and accessory for Honey puppy, who looks adorable with a pink crown and collar. Bright colours, iconic details and fairy-tale decals decorate the Rainbow Cove castle both inside and out for multiple angles of play. 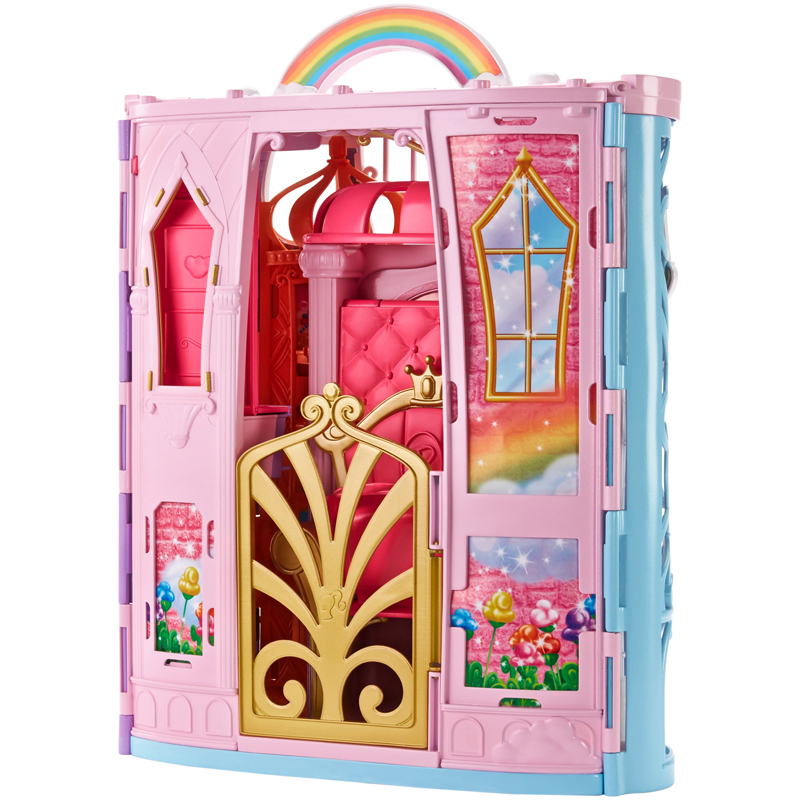 A folding design and rainbow handle make it easy to pack up the Barbie castle for portability or storage. 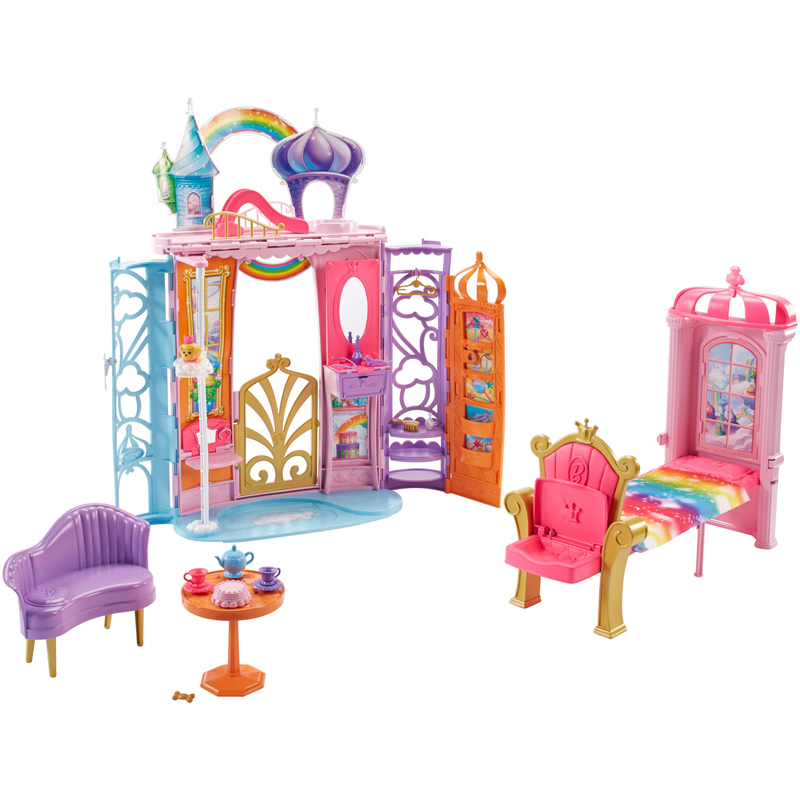 Young imaginations can tell all kinds of tales with the Barbie Dreamtopia castle because when you enter Dreamtopia with sisters Barbie and Chelsea, you wake up to a world where dreams become reality! Collect all the Barbie Dreamtopia dolls and accessories and let your dreams take flight. Includes Barbie Dreamtopia castle, transforming throne/bed, sofa, table, themed accessories and puppy figure. Doll not included. Colours and decorations may vary. Enter the Barbie Dreamtopia land of Rainbow Cove when youpass through the golden gate of this colourful doll castle that hasmultiple play spaces, transformative features and storytellingpieces! The fairy-tale dollhouse is designed for portability with adesign that opens for playtime and folds shut for travel and storage; arainbow handle makes carrying the playset a breeze. 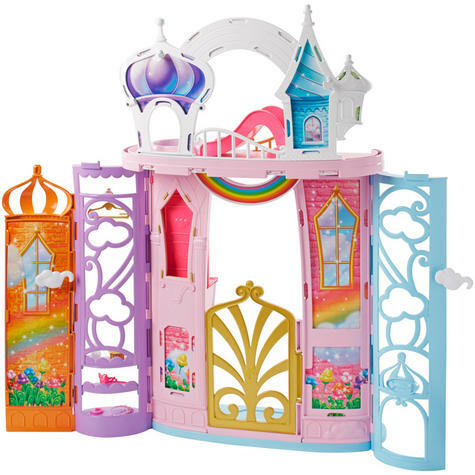 4 areas in the Barbie castle offer a magical transformationto expand the play possibilities: lift the chest of drawers to reveal adoll vanity with mirror; flip down the pet seat on the wall and createa vanity with a mirror for Honey puppy; release the princess throne tofold out into a bed (with soft rainbow-print blanket) for Barbie dolland her pet (doll sold separately); and send Honey puppy up to therooftop by lifting the cloud-shaped platform. Lots of colourful accessories inspire all-day play: ateapot, teacups and cake serve up fun for a royal tea party; a tiara,necklace, hanger and perfume bottles dress up stories with colourfulstyle; a bone and puppy accessory for Honey figure allow nurturing playand pet bonding. Collect all the Barbie Dreamtopia dolls and accessories toexplore a world where dreams become reality because you can be anythingwith Barbie (each sold separately, subject to availability).